You may have come across warnings about consuming foods high in nitrates and/or nitrites, with respect to both animal- and plant-based foods. But what does the science say? 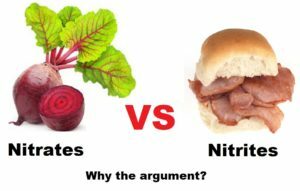 Whilst previous blogs have touched on this subject – specifically in relation to chewing vs juicing 1 and whether athletic performance is affected by nitrate consumption 2 – here, the subject of dietary nitrates and nitrites is covered in more depth, to provide some clarity on which foods are to be avoided and which are to be embraced. Really, this is all about a vital molecule called nitric oxide (with the chemical formula NO). In any list of the most important compounds within the human body, NO is right up there. It’s so important because it gets involved in pretty much every single organ system within the body and has a central role as a major and powerful vasodilator. This means that it makes blood vessels wider – of immense importance in allowing the blood to flow without the heart having to strain. The list goes on and on…really, it’s hard to over-estimate the importance of NO for human health. But what have nitrates and nitrites got to do with nitric oxide? L-arginine is found in many protein-containing foods, both animal- and plant-based 21 . Increasing age, smoking, high cholesterol, inflammation, dietary deficiencies and other factors can negatively affect the functioning of the enzyme required for this conversion of L-arginine to NO. 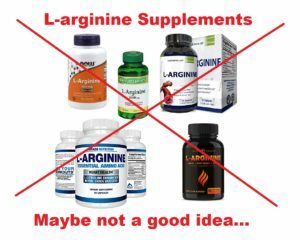 And the problem of insufficient L-arginine is not solved by taking L-arginine supplements – indeed, L-arginine supplements have been shown, not only to be ineffective and even cause less NO to be produced 23 , but such supplements have led to increased mortality when given to patients who have had heart attacks 24 . In fact, not only that, it’s been shown to cause cardiovascular risk in perfectly healthy men, as well 25 . So what do we need to do to ensure that we have optimal NO levels? In 1987, Bob Furchgott 26 was the first to propose that NO was the EDRF (endothelium-derived relaxing factor) – i.e. that NO was the stuff responsible for the observed dilation of blood vessels, as well as a range of other vital physiological processes. Thus, NO is a relative newcomer to pharmacology. 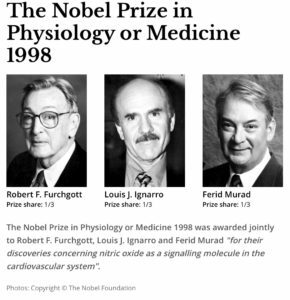 However, its impact was so significant that Bob Furchgott and his two collaborators, Louis J Ignarro and Ferid Murad, received the Nobel Prize in Physiology for its discovery. Since then, hundreds of thousands of papers have been published with reference to NO – both in respect of NO as the endothelium-derived relaxing factor, as well as the role of L-arginine in NO synthesis. During this time, and until fairly recently, there was a particular concern about a potential increase in cancer risk from dietary nitrates and nitrites. 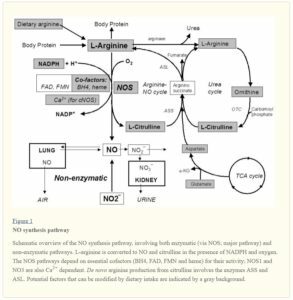 This concern was accompanied by (and perhaps, to some extent, based on) the mistaken belief that the enzyme responsible for synthesising L-arginine within the body was the only pathway to produce NO in humans. However, it’s been shown that when we ingest dietary nitrate, bacteria in the oral saliva convert it to nitrite. This nitrite is then swallowed and gets further converted into NO within the stomach, blood vessels and tissues 28 29 . We’ve looked previously 30 at the important role played by the bacteria in our mouths (the oral microbiome), and how it differs between meat- and plant-eaters. It’s important to stress that these oral bacteria are absolutely essential for the production of NO from our foods. Indeed, they are vital for this process, since humans can’t convert dietary nitrate to nitrite – it’s the bacteria living in our mouths that do the conversion. So, predictably enough, it’s been shown 31 32 that, if you kill these oral bacteria by using an antibacterial mouthwash or taking antibiotics, the production of NO from dietary nitrate can stop completely. Additionally, if you spit a lot, you can deplete the bacterial concentration in your mouth, and this has a significant effect on nitrate conversion 29 . Stomach acid also provides another important step in the production of NO from dietary nitrate 33 . Therefore, reducing the concentration of stomach acid by taking certain medication, including antacids and acid-reducing medications (such as Losec 34 ) can also decrease NO production and, thus, diminish its protective benefits 28 . Today, dietary nitrate is understood as a highly significant precursor to NO in a dose-dependent manner 35 . 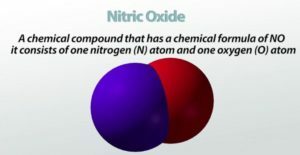 So, the more nitrate consumed, the more NO becomes available in the body. There are, of course, upper limits, but these are only when nitrates are consumed in very large quantities, and this is unlikely (if even possible) from eating a WFPB diet – unless you’re unwise enough to take supplements. Plants are the primary source of dietary nitrates, while processed/cured meats are the primary sources of dietary nitrites (used as preservatives). It will comes as no surprise that the latter have a different impact on human health than the former. Ingesting nitrates in plants increases NO and provides protective and healing benefits for a wide range of diseases characterised by insufficient NO (see the above list). Ingesting nitrites in processed and cured meats (bacon, frankfurters, etc) can cause the nitrites to react with the amino acids, fat and haem iron already present within the meat, resulting in the formation of harmful substances before the meat is even cooked or eaten 36 37 . A previous blog 38 went into more detail on how meat preservation methods have led to such foods being classified as Group 1 carcinogens, along with tobacco and asbestos. When nitrites are consumed in animal foods, they can form nitrosamines 39 40 – one of the carcinogenic agents also present in cigarette smoke. Nitrosamines in processed meats (smoked, canned and preserved), as well as in grilled meats, are formed from nitrites in the absence of phytonutrients and antioxidants found in plant foods. 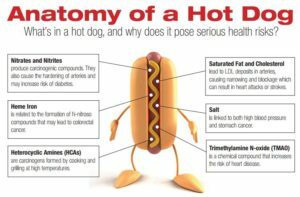 “Just a few hot dogs may contain the carcinogenic nitrosamine load of a pack of cigarettes. In fact, just the smell of frying bacon even contains nitrosamines.” 41 Indeed, whenever you consume a diet high in animal foods (whether it’s processed meats or organically-produced eggs or dairy), you’re consuming nitrites in the absence of the phytochemicals and antioxidants that only plants contain. A previous blog, which looked at the effects of NO on athletes 2 , emphasised how important NO is for optimal athletic performance and recovery. Basically, dietary nitrate in plant foods increases the diameter of blood vessels, thereby increasing the volume of blood moved around the body with each heartbeat. This increases oxygen production to the muscles and thus increases muscle strength. Another aspect of the relationship of NO to physical activity is ATP (adenosine triphosphate) . ATP is produced when the food we’ve eaten is metabolised in the presence of oxygen 42 . ATP is within every cell of our bodies and produces the energy we need to survive and function. The more oxygen within our red blood cells, the more ATP can be produced and, thereby, the more energy we can have available to us. However, it’s not just a matter of being an athlete with bigger lungs that facilitates this; recent research has shown 43 that dietary nitrate can actually decrease the amount of oxygen you need in order to produce sufficient ATP – that is, more work can be performed using the same amount of oxygen inhaled. Dietary intake of nitrates appears to be particularly effective for short-term, high-intensity rather than long-term, less intensive exercise. Furthermore, it appears 44 that dietary nitrate also improves the efficiency of our mitochondria (the energy-producing powerhouses within every human cell). Thus, increased nitrate consumption can have significance for athletes, people who live at high altitudes (where oxygen levels are lower in the air), and people with certain oxygen-limited diseases (e.g. lung disease or sleep disorders) . Research has shown 45 particular benefits of nitrate consumption for those individuals who have lower fitness levels and/or impairments related to their muscles, heart and/or lungs, for instance in cases of non-ischaemic, dilated cardiomyopathy 46 , COPD 47 , heart failure 48 , and peripheral artery disease 49 . There are few conditions that cause more chronic illness and early deaths than hypertension. And the increase in the number of people affected is clearly associated with the increase in prevalence of the Western diet – richer in animal foods and processed junk than any time in human history. And it’s all connected to the function of NO. Since two of NO’s major functions are to maintain the health of the single layer of delicate endothelial cells lining our blood vessels, and to ensure that our blood vessels dilate effectively, any reduction in production of NO is bound to result in damage to the integrity and flexibility of the vessels. Even in early studies with young, healthy individuals, it’s been shown 50 51 that dietary nitrate-consumption decreases their blood pressure. More recent research also demonstrates 52 53 54 how it can also decrease blood pressure in those more at-risk populations who already have high blood pressure. One study 55 concluded: “an additional strategy, based on intake of nitrate-rich vegetables, may prove to be both cost-effective, affordable and favourable for a public health approach to hypertension.” Another study 56 showed how chronic OSA (obstructive sleep apnea) could be effectively treated by reducing blood pressure as a result of simply eating more dietary nitrates in plant-based foods. And research is starting to suggest 57 that brain disorders such as dementia, Alzheimer’s disease, etc may be helped by dietary nitrates helping to increase blood flow to the brain. As with most aspects of nutrition, doing the right thing for longer is more effective than doing it for shorter periods of time. This is no different with vegetable-consumption and NO production. It appears that the longer you eat a plant-based diet, the more beneficial the effects on your health. It makes sense, therefore, that transitioning to a life-long WFPB diet, rather than merely opting for a short period of relief from animal proteins (for instance, during Veganuary) and processed junk, is the way to enjoy maximum life-long benefits. 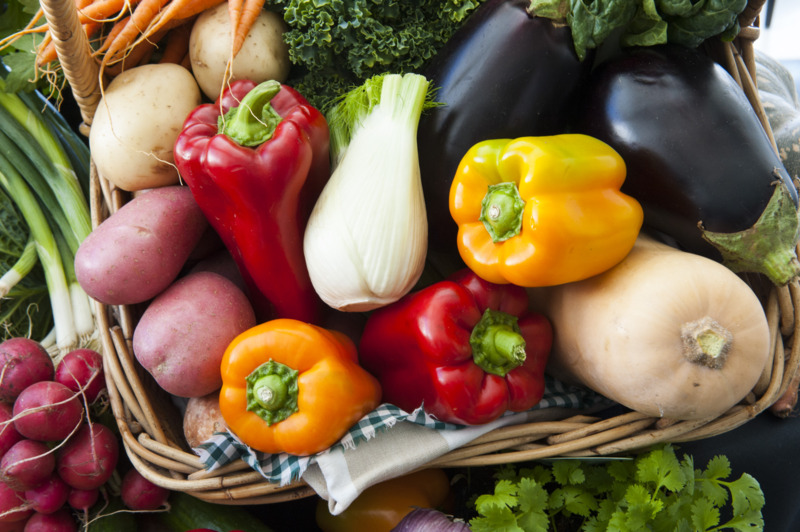 How Safe Is Dietary Nitrate? 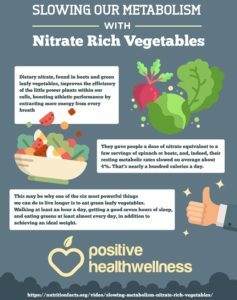 Ingesting nitrates when they are inside vegetables is extremely safe, being that they are combined with fibre, antioxidants and phytochemicals. Having said this, infants under the age of three months should not be given dietary nitrates – that is, not fed vegetables 59 . This shouldn’t even be an issue since, as we saw in a highly-detailed previous blog on Vegan Pregnancy & Parenting 60 , all babies of this age should only be receiving breast milk or, if that is not available, appropriate formula milk. Although there is some variation in levels (depending on plant type and the quality of the soil used for growing), it’s important to understand that all whole plant foods contain nitrates. Whilst around 85% of nitrates will come from the plants you eat, around 15% is actually contained in the water you drink 62 . Surveys of dietary habits in the US and Europe show 65 52 low levels of daily nitrate intake (~0.5-3 mmol/day), which is consistent with the low levels of vegetable consumption. All diets which tend to contain more vegetables (such as Japanese diets, the DASH diet, vegetarian and vegan diets), all show 66 a higher amount of nitrate intake (~20 mmol/day) than standard Western diets. The positive effects of dietary nitrate don’t last for ever. The peak effectiveness appears to be 29 at around three hours after consumption. There’s still some benefit after this point, but after 24 hours the effect of the nitrate is virtually nil. Thus, the ideal diet would consist of nitrate-rich foods being consumed at least a couple of times each day. In terms of nitrate quantity, one study suggests 67 that 8.4-16.8 mmol/day produces the greatest improvement in NO utilisation (and, hence, in exercise performance), while 4.2 mmol/day produces little or no effect and anything above 16.8 mmol/day appears to achieve no additional benefits. The suggestion is that maximum benefit is achieved with ~10 mmol/day – quite manageable by eating a moderate amount of varied plant foods (green leafy veg, beetroot, rhubarb, etc). Exercise is also reported to increase NO production. Finally, how better to finish than a short video by Dr Michael Greger? J Clin Hypertens (Greenwich). 2006 Dec;8(12 Suppl 4):17-29. Nitric oxide in hypertension.